Alumni representing almost all of the graduating classes of the former Booker T. Washington High School were among those saddened when its doors closed in 1970. But many of them returned to their old campus for roll call and several days of celebrations this past week during an all-school reunion. Former classmates chose the Fourth of July holiday weekend to gather in the Capital City to commemorate the institution’s beginning as the Swayne School and its subsequent 105-year history of educating Montgomery’s youth. While there were typical reunion activities, they spent a lot of time remembering their own impacts on the school’s legacy and treasuring the reflections of “now and in the years to be,” a poignant line of the school’s song, written by the late educator and performer Jesse D. Cook. Festivities began last Thursday with a banquet at the Embassy Suites hotel, when State Rep. John Knight,BTW basketball center and graduate of the class of 1963, galvanized them as the keynote speaker. Valtina Day Rankins, a member of the last graduating class, was there for the event organized by more than 15 members of the National Alumni Association. Alumni president Walter Harris, class of ’59, and Jessie Mae Williams, class of ’52, followed their reunion tradition and gathered with others at Lagoon Park’s Pete Peterson Lodge for a casual picnic on Saturday. 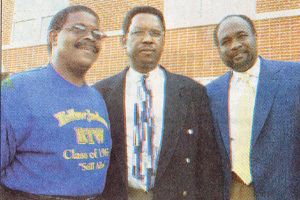 Eugene Riley, left, Richard Bailey, center, and Jimmy Barker, right, were among those attending this past week’s all-school reunion for alums of Booker T. Washington High School. Alabama historian and author Richard Bailey, class of 1966, planned a two-phased gathering on Sunday as a part of the 2004 Alumni Homecoming. It included an afternoon of fond remembrances delivered by former administrators, teachers, athletes, coaches, student leaders and family members. A crowd of 200 gathered in Cafe de L’Ame, the lunchroom of the current BTW Magnet School, as a prelude to another proud moment for the graduates. Current BTW Magnet School principal Quesha Starks led them on a walk through the old tunnel under Union Street, a place filled with years of high school memories gone by, to the streetside unveiling of an historical marker. The marker commemorates the history of Swayne School, founded in 1865 on one side, and the former BTW High, which graduated its first class under the name of Booker T. Washington High School in 1940 and closed its doors in 1970. Former City Council member and benefactor Tracy Larkin, a 1963 BTW alum, provided the funding for the historic marker, which actually arrived in February but was not unveiled until . Sunday to coincide with the return to Montgomery for the all-school gatherings. Larkin was introduced by fellow classmate and U.S. Sen. Eddie Harbison, D-Ga., as the keynote speaker for the nostalgic afternoon. Laura McDade Chalk, president of the class of 1964, arrived from Huntsville and had the honor of performing the actual unveiling. Among the many others on hand for the sentimental occasions were Carol Poe of Birmingham, president of the Black Heritage Council of the Alabama Historical Commission; former BTW football player Michael Washington, class of 1963, who went on to success playing for Coach Paul “Bear” Bryant at the University of Alabama; Leon Ross, ’59, and Jimmy Barker, class of ’68, who represented the Montgomery County Board of Education; Lionel Gamier, a former principal; Lettie Ross, a teacher at BTW during the early 1960s; Helen Shannon, whose late husband, James Shannon, was a BTW athletic coach; Robert Shannon, a 1933 alum of Swayne School, and his sons, Robert and Charles Shannon, who drove all night from Detroit to attend the ceremonies; Charlie Hardy, class of ’58, who sat next to Lula Davis, wife of the late Arthur “Buddy” Davis, whose winning tenure as head football coach lasted 16 years; Cornelius Howard, who returned for the reunion from Port Verde, Fla., and who led the BTW Yellow Jackets to state and national championships during his days as basketball coach; Simuel Sippial, class of ’61; Aubara Ramsey, class of 1966; James Jemison and Larry Weatherly, both of the class of ’68; Paulette Moncrief; and Loveless Babies, who returned to the Capital City from Jonesboro, Ga., and fondly called the group to attention with his hand whistle, as he had done several years as a legendary drum major for the BTW Marching 100. While several alums wore gold 2004 reunion T-shirts,Thomas Parks and his fellow classmates stood out in special blue-tees as the class of 1965. Lemuel Green, Larry Brown, Jeanetta Austin, Hardwick Prevo, Janice DuBose, Julia Sanders, Walter Jeter and Quinton Harris were among those on hand for the unveiling, and were among the 95 members of their class who continued the reunion festivities with a final party Monday evening at the Governor’s House Hotel and Conference Center. Eugene Riley, vice president of the class when they were seniors, was there with his wife, Alberta, as the group danced until midnight to the sounds of • music provided by DJ Lynden McCall. Riley was excited because his had the honor of being the 100th class to graduate from BTW.